The Twittertape Machine « Adafruit Industries – Makers, hackers, artists, designers and engineers! 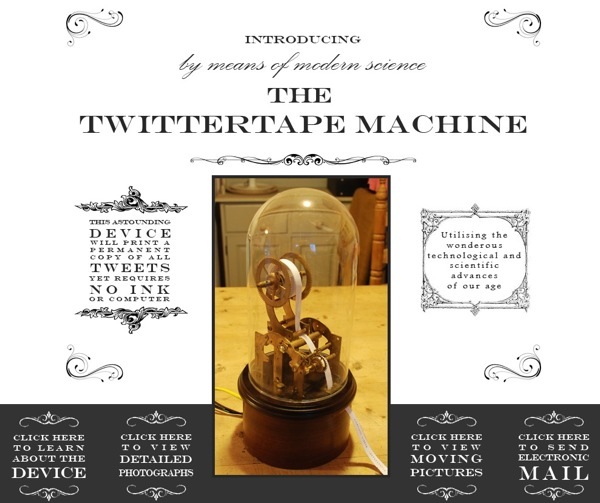 The Twittertape Machine is a prototype standalone networked device that prints a feed of your tweets and mentions on Twitter. The design is inspired by the ticker tape machines of the late 1800’s that kept the rich and famous up to date with the movement of their stocks and shares. No ink or computer is required, simply give the machine power and an Ethernet connection to the internet and it will automatically check Twitter for new tweets every 30 seconds. Though fully functional, this version is a primarily a prototype and proof of concept. Improvements planned for Version 2 include switching the Ethernet connection to Wifi and integrating a user control panel to enable the selection of multiple web-based data feeds such as RSS or Facebook. Hope you all like it, I’d love to hear what you think so please feel free to drop me a line via the site – Adam. Tweeting like a boss? Yes, yes indeed sir. Very nice work. Too bad the (also beautiful!) website doesn’t have any detailed pictures or information about where he got the ticker and how he modified it to print tweets. Hopefully he’ll get to that later.